The Barklow surname (and its many spelling variations) is Dutch in origin. The name derives from the village of Borculo in the Netherlands in Gelderland province, close to where our ancestors lived before coming to America. While living in the Netherlands though, our family used the name "Lubberdinck," which was a Dutch surname with a long history. After moving to New York in the 17th Century, the two original brothers added "Van Borculo" to their names to designate where they had come from. Eventually, the "Van" was dropped from the name and the spelling of "Borculo" was butchered over time. Our line of Barklows did not escape these name changes, and the most common spellings appear to have been: Barklow, Barkelow and Bartlow. Bernt Lubberdinck was born circa 1570 in the Netherlands. He died after 1627 in Geesteren, Gelderland, Netherlands. He was married to a Toniske Van Keppel. They lived in Geesteren, Gelderland, Netherlands. They had at least one child: Jan (see next generation). They died after 1627. Bernt married Toniske Van Keppel circa 1588 in Gelderland, Netherlands. She was born circa 1570 and died after 1627 in Geesteren, Gelderland, Netherlands. Jan Bernt Lubberdinck was born circa 1590 in Geesteren, Gelderland, Netherlands 5. He died circa 1662 in Geesteren, Gelderland, Netherlands 5. Jan appears to have spent his whole life in the village of Geesteren. He was married on April 2, 1617, in the town of Lochem, in Gelderland, to Jannekeen Aelinckhave. They had 6 children: Bernt, Willem, Jan, Harmen (see next generation), Gerrit, and Geertruijt. Sometime between about 1633 and 1653, his wife Janneken died. Prior to 1653, he remarried a second time to Geesken. They had 4 sons: Jan, Arent, Berentje, and Arent. Jan is said to have died circa 1662 in Geesteren, Netherlands. He is supposed to have been buried in the Lubberdinck Cemetery there. Jan married first Janneken Aelinckhave on April 2, 1617 in Lochem, Gelderland, Netherlands 5. She was born before January 17, 1591/2 in Lochem, Gelderland, Netherlands 5. She died before November 1653 in Geesteren, Gelderland, Netherlands 5. 1 Bernt Lubberdinck was born circa 1618 in Geesteren, Gelderland, Netherlands 5. He died after 1652 5. 2 Willem Janse Lubberdinck Van Borculo was born circa 1621 in Geesteren, Gelderland, Netherlands 5. He died in November 1683 in Amersfoot (Flatlands), Kings Co., New York 5. He married first Cornelia Van Salee on February 3, 1657/8 in Gravesend, Kings Co., New York 5. He married second Leysabet Janse Claeszen circa 1666 in Kings Co., New York 5. 3 Jan Lubberdinck was born circa 1623 in Geesteren, Gelderland, Netherlands 5. He died after 1670 5. He married Reintje Moll before 1655 in Gelderland, Netherlands 5. 5 Gerrit Lubberdinck was born circa 1629 in Geesteren, Gelderland, Netherlands 5. He married Geesken J. Bruininck on October 15, 1654 in Geesteren, Gelderland, Netherlands 5. 6 Geertruijdt Lubberdinck was born circa 1633 in Geesteren, Gelderland, Netherlands 5. She married Jan Roosinck on January 23, 1669/70 in Geesteren, Gelderland, Netherlands 5. Jan married second Geesken before 1653 5. 7 Jan Lubberdinck was born before February 24, 1653/4 in Geesteren, Gelderland, Netherlands 5. 8 Arent Lubberdinck was born before November 4, 1655 in Geesteren, Gelderland, Netherlands 5. He died before 1660 in Geesteren, Gelderland, Netherlands 5. 9 Berentje Lubberdinck was born before July 5, 1657 in Geesteren, Gelderland, Netherlands 5. 10 Arent Lubberdinck was born before September 9, 1660 in Geesteren, Gelderland, Netherlands 5. Harmen Janse (Lubberdinck) Van Borculo was born circa 1626 in Geesteren, Netherlands 5. He ded before May 1672 in New Utrecht, Kings Co., New York 5. Harmen was a farmer and lived in Geesteren. He was married there on April 11, 1653 to Willempje Elderinck. They had 3 children there: Janneke, Janneken, and Reint. It was sometime between about 1660 and 1662, that Harmen moved with his family across the Atlantic Ocean to make their home in the Dutch Colonies of what would become New York. Apparently, Harmen's older brother Willem had already moved there and was living at Gravesend, New York. Harmen and his family settled at New Utrecht (now a part of Brooklyn). They had 3 more children there: Harmen, Jan, and Willem (see next generation). Harmen did not get to live for long in the colonies. He died before May of 1672 in New Utrecht, now Brooklyn, New York. Afterwards his widow remarried to Harmen Harmenson and she died in 1697 in New Jersey. Harmen was the first of the family who began going by the name Van Borculo (the family lived in Holland near a village called Borculo). Eventually the "Van" was dropped and the name became Borculo and its many variations. Harmen married Willempje Warners Elderinck on April 11, 1653 in Geesteren, Gelderland, Netherlands 5. She was born circa 1630 in Hengelo, Gelderland, Netherlands 5. She died on October 28, 1697 in Constable's Hook (Bayonne), Bergen Co., New Jersey 5. 1 Janneke Harmense Lubberdinck was born before March 27, 1654 in Hengelo, Gelderland, Netherlands 5. She died before 1656 in Geesteren, Gelderland, Netherlands 5. 2 Janneken Harmense Lubberdinck Van Borculo was born before April 27, 1656 in Geesteren, Gelderland, Netherlands 5. She died after 1710 in Bensalem Twp., Bucks Co., Pennsylvania 5. She married Hendrick Van Dike on February 29, 1679/80 in Flatbush, Kings Co., New York 5. 3 Reint Harmense Lubberdinck Van Burkelow was born before June 5, 1659 in Geesteren, Gelderland, Netherlands 5. He died in September or November 1713 in Bombay Hook, New Castle Co., Delaware 5. He married Mary Schumacher circa 1688 in Germantown, Philadelphia Co., Pennsylvania 5. 4 Harmen Harmense Van Burkeloo was born circa 1662 in New Utrecht, Kings Co., New York 5. He died after December 2, 1728 in Bohemia Manor, Cecil Co., Maryland 5. He married Margaret Abell circa 1690 in Cecil Co., Maryland 5. 5 Jan Harmense Barkeloo was born circa 1664 in New Utrecht, Kings Co., New York 5. He died before 1708 in Northfield, Richmond Co., New York 5. He married Margaret circa 1683 in Bayonne, Bergen Co., New Jersey 5. Willem Harmense Barkeloo was born circa 1666 at New Utrecht, Kings Co., New York 5. He died after 1738 in New Utrecht, Kings Co., New York 5. Willem was raised in New Utrecht and was married there on April 5, 1697 to Maria Cortelyou, the daughter of Jacques Cortelyou a prominent New Utrecht citizen. Willem and Maria had 4 children: Jacques (see next generation), Wilmetian, Harmanus, and Helen. Willem was apparently a land surveyor, an occupation he gained possibly out of influence from his father-in-law who was also a surveyor. Willem and his wife Maria both died after the year 1738 in New Utrecht, New York. They are supposed to have been buried at the Barkeloo Cemetery there. Willem married Maria Cortelyou on April 5, 1697 in New Utrecht, Kings Co., New York 5. She was born circa 1669 in New Utrecht, Kings Co., New York 5. She died after 1738 in New Utrecht, Kings Co., New York 5. 2 Wilmetian Barkeloo was born circa 1700 in New Utrecht, Kings Co., New York 5. He died after 1721 5. 3 Hermanus Barkeloo was born circa 1705 in New Utrecht, Kings Co., New York 5. He died after September 8, 1752 in New Utrecht, Kings Co., New York 5. He married Sarah Terhune circa 1729 in New Utrecht, Kings Co., New York 5. 4 Helen Barkeloo was born circa 1707 in New Utrecht, Kings Co., New York 5. She died on April 26, 1768 in Blawenburg, Somerset Co., New Jersey 5. She married Michael Blaw circa 1724 in New Utrecht, Kings Co., New York 5. Jacques Barkeloo was born circa 1698 in New Utrecht, New York 5. He died before August 19, 1780 in Kingwood Twp., Hunterdon Co., New Jersey 5. Jacques was raised in New Utrecht, New York, where he either went by the names of Jacques or Jacob. In about the year 1726, he was married to Jannetje (surname possibly Barentsen). Probably immediately after his marriage in about that year, Jacques and Jannetje moved to Hunterdon County, New Jersey where his father had purchased land in 1719. Apparently he and Jannetje first lived at a place called Holland's Brook, or Readington Township. Then in about the 1740's they moved to Kingwood Township, where they remained. Jacques had 8 known children: William (see next generation), Barent, Jacques, Jan, Cornelius, Helena, Hermanus, and Margaretta. Jacques was a farmer and after moving to the English-speaking New Jersey, his name was anglicized and he began to be called James while his wife was called Jane. Jacques died before August 19, 1780 at his home in Kingwood Township, Hunterdon County, New Jersey. His widow Jane died there after 1785. Jacques married Jannetje circa 1726 in New Utrecht, Kings Co., New York 5. She was born circa 1705 in New York 5. She died circa 1785 in Kingwood Twp., Hunterdon Co., New Jersey 5. 2 Barent Barkelow was born before May 24, 1730 in Readington Twp., Hunterdon Co., New Jersey 5. He died circa 1800 in Southampton Twp., Cumberland Co., Pennsylvania 5. 3 Jacques Barkelow was born before January 1, 1731/2 in Readington Twp., Hunterdon Co., New Jersey 5. He died on January 16, 1797 in Springfield Twp., Hampshire Co., Virginia (now West Virginia) 5. He married Elizabeth Johnson circa 1759 5. 4 Jan Barkelow was born before April 14, 1734 in Readington Twp., Hunterdon Co., New Jersey 5. He died after May 1, 1792 in Kingwood Twp., Hunterdon Co., New Jersey 5. 5 Cornelius Barkelow was born before August 8, 1736 in Readington Twp., Hunterdon Co., New Jersey 5. He died after August 7, 1806 in Kingwood Twp., Hunterdon Co., New Jersey 5. He married first Jannetje circa 1764 5. He married second Providence Blue circa 1783 5. 6 Helena Barkelow was born before July 21, 1741 in Readington Twp., Hunterdon Co., New Jersey 5. She died after May 1793 in Middle Smithfield, Northampton (now Monroe) Co., Pennsylvania 5. She married Isaac Bunnel in 1765 5. 7 Hermanus Barkelow was born before February 25, 1745/6 in Readington Twp., Hunterdon Co., New Jersey 5. He died after 1813 in Kingwood Twp., Hunterdon Co., New Jersey 5. He married Jane circa 1790 5. 8 Margaretta Barkelow was born circa 1748 in Kingwood Twp., Hunterdon Co., New Jersey 5. She died after 1810 in Delaware Twp., Wayne Co., Pennsylvania 5. She married Johannes Van Etten in 1767 5. William Barkelow was born circa 1726 at Holland's Brook, Hunterdon County, New Jersey 5. He died after February 28, 1791 in Frankford Twp., Sussex Co., New Jersey 5. There is not much known of the details of William's life. He was married circa 1747, and his wife's name may have been Eleanor (surname may have been DeLong?). They lived in Kingwood Township, Hunterdon County, New Jersey, and had 7 children: Jane, James (see next generation), William, John, Cornelius, unknown daughter, and Daniel. It was sometime after their children were born that William moved to Frankford Township, Sussex County, New Jersey. He died there after February 28, 1791. William married name unknown circa 1747 in Hunterdon Co., New Jersey 5. She was born circa 1728 5 an died after 1763 5. 1 Jane Barkelow was born circa 1747 in Kingwood Twp., Hunterdon Co., New Jersey 5. She died on March 7, 1829 in Girard, Erie Co., Pennsylvania 5. She married William Silverton circa 1768 in Hunterdon Co., New Jersey 5. 3 William Barklow was born circa 1755 in Kingwood Twp., Hunterdon Co., New Jersey 5. He died before February 13, 1813 in Muncy Creek Twp., Lycoming Co., Pennsylvania 5. He married Sarah L. Schamp circa 1780 in Kingwood Twp., Hunterdon Co., New Jersey 5. 4 John W. Barklow was born circa 1756 in Kingwood Twp., Hunterdon Co., New Jersey 5. He died before February 22, 1830 in Frankford Twp., Sussex Co., New Jersey 5. He married first Elizabeth Dudbridge circa 1783 in Hunterdon Co., New Jersey 5. He married second Susan Spangenburg on May 23, 1820 in Sussex Co., New Jersey 5. 5 Cornelius Bartlow was born on November 4, 1760 in Kingwood Twp., Hunterdon Co., New Jersey 5. He died on December 4, 1833 in Moreland Twp., Lycoming Co., Pennsylvania 5. He married Jane Schamp circa 1784 in Kingwood Twp., Hunterdon Co., New Jersey 5. 6 unknown female Bartlow was born circa 1765 in Kingwood Twp., Hunterdon Co., New Jersey 5. She died after 1840 in Penn Twp., Lycoming Co., Pennsylvania 5. She married Samuel Morris circa 1785 in Hunterdon Co., New Jersey 5. 7 Daniel Bartlow was born circa 1768 in Kingwood Twp., Hunterdon Co., New Jersey 5. He died between 1799-1810 in New Jersey or Ohio 5. He married Rachel Ward on January 9, 1799 in Cincinnati, Hamilton Co., Ohio 5. James Barkelow was born on July 3, 1753 at the family farm in Kingwood Township, Hunterdon County, New Jersey 5. He died in 1834 in West Buffalo Twp., Union Co., Pennsylvania 5. James spent the whole of his youth and young adulthood in Hunterdon County, New Jersey. It was while living there during the 1770's that James served as a private during the American Revolution. He served in Captain Samuel Growendyck's Company of Hunterdon County Militia Volunteers. After his service he returned to Hunterdon County, where he married circa 1783 to a woman named Elizabeth (surname probably Yager). They first lived in Alexandria Township in Hunterdon County until 1786 when they moved to Pennsylvania. James and his family lived in a part of York County, Pennsylvania that would eventually become Adams County. They lived there from about 1786 to 1794. In 1794, they moved to Northumberland County, Pennsylvania, where they settled at West Buffalo Township (this became Union County in 1813). Then in the early 1810's James' wife Elizabeth died. In about the year 1814, James remarried to a woman whose name may have been something along the lines of Mary Van Rensselaer. They had 2 sons. James' second wife did not survive long and died probably in the late 1810's. Then in 1823, James remarried to a woman named Elizabeth (name may have been Chambers), by whom he had two children. James died at his home in West Buffalo Township, Union County, Pennsylvania sometime between March 11, 1834 (the date he wrote his will) and April 24, 1834 (the date the will was filed). His widow continued living in Union County until her death in 1844 or 1845. James married first Elizabeth Yager(?) circa 1783 in Hunterdon Co., New Jersey 5. She as born circa 1765 5 and died circa 1810-1813 in West Buffalo Twp., Union Co., Pennsylvania 5. 1 William Bartlow was born circa 1784 in Alexandria Twp., Hunterdon Co., New Jersey 5. He died between 1800-1805 in West Buffalo Twp., Northumberland (now Union) Co., Pennsylvania 5. 2 Francis Bartlow was born on December 21, 1786 in Mt. Pleasant Twp., York (now Adams) Co., Pennsylvania 5. He died circa 1847 in Waynesfield Twp., Lucan Co. Ohio 5. He married Rebecca Tipton in May 1815 at Mifflinburg, Union Co., Pennsylvania 5. 3 Elinor Bartlow was born on October 10, 1787 near Gettysburg, in York (now Adams) Co., Pennsylvania 5. She died circa 1845 in Spring Twp., Centre Co., Pennsylvania 5. She married William Gill on November 24, 1807 in Northumberland (now Union) Co., Pennsylvania 5. 4 James Bartlow was born on April 9, 1790 in Straban Twp., York (now Adams) Co., Pennsylvania 5. He died on June 25, 1860 in Loran Twp., Stephenson Co., Illinois 5. He married Annah Meetlen on January 30, 1817 at Mifflinburg, Union Co., Pennsylvania 5. 5 unknown female Bartlow was born circa 1793 in Straban Twp., York (now Adams) Co., Pennsylvania 5. She died between 1800-1810 in West Buffalo Twp., Northumberland (now Union) Co., Pennsylvania 5. 6 Elizabeth Bartlow was born on November 15, 1796 in West Buffalo Twp., Northumberland (now Union) Co., Pennsylvania 5. She died on January 13, 1872 in Buffalo Twp., Union Co., Pennsylvania 5. She married George Slear on November 7, 1833 at Mifflinburg, Union Co., Pennsylvania 5. 7 Eleanor Bartlow was born on March 7, 1802 in West Buffalo Twp., Northumberland (now Union) Co., Pennsylvania 5. She died on October 17, 1870 in Berreman Twp., Jo Daviess Co., Illinois 5. She married Francis McGinnis on October 20, 1850 in Loran Twp., Stephenson Co., Illinois 5. James married second name unknown circa 1814 in Union Co., Pennsylvania 5. She was born circa 1790 5 and died circa 1816-1817 in West Buffalo Twp., Union Co., Pennsylvania 5. 8 John Benjamin Barklow was born on March 5, 1815 in West Buffalo Twp., Union Co., Pennsylvania 5. He died after September 8, 1870 in Jefferson Twp., Stephenson Co., Illinois 5. He married Catherine Overly on October 12, 1839 at Mifflinburg, Union Co., Pennsylvania 5. He married second Barbara Jordan on April 1, 1862 at Pearl City, Stephenson Co., Illinois 5. 9 Van Rensselaer Barklow was born circa 1816 in West Buffalo Twp., Union Co., Pennsylvania 5. He died on April 15, 1883 in Bellevue, Huron Co., Ohio 5. He married first Catherine Bogenrief on September 25, 1840 at Mifflinburg, Union Co., Pennsylvania 5. He married second Margaret Mary circa 1854 in Union Co., Pennsylvania 5. James married third Elizabeth circa 1823 in Union Co., Pennsylvania 5. She was born circa 1790 in Pennsylvania 5. She died circa 1845 in West Buffalo Twp., Union Co., Pennsylvania 5. 10 Benjamin Chambers Barklow was born on July 31, 1824 in West Buffalo Twp., Union Co., Pennsylvania 5. He died on September 11, 1879 in South English, Keokuk Co., Iowa 5. He married Lydia Adams circa 1848 at Mifflinburg, Union Co., Pennsylvania 5. Flora Ann Bartlow was born on March 8, 1826 in West Buffalo Township, Union County, Pennsylvania 1. She died on June 5, 1896 in Manzanita Pct. (now Medford), Jackson Co., Oregon 2,3. She is buried in the Central Point I.O.O.F. Cemetery, Central Point, Jackson Co., Oregon. Flora's elderly father died in 1834, when she was 8 years old. Then in about 1845, when she was about 19 years old, her mother died. After this, Flora probably lived with her brother Chambers Barklow in Union County, Pennsylvania. In 1848, most of Flora's family left Pennsylvania and she joined in the exodus of the family. In 1848, the family settled in Stephenson County in northern Illinois. 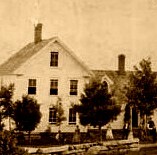 Flora lived with her brother Chambers until November 3, 1850, when she was married to James Murray at Pearl City in Stephenson County. James and Flora were farmers and lived primarily in Loran Township in Stephenson County, Illinois. They had 12 children: David, Samuel, James, George, Mary, John, stillborn twins, Eleanor, Sarah, William, and Anna. Eventually they decided to move away. In the fall of 1871 (other sources suggest in 1870 or 1874), they left their relatives in Illinois and moved to Jackson County, in southern Oregon. An interview in 1982 with their granddaughters Milly Gorden Glass and Matty Gorden Rodgers indicates that the family somehow found their way to San Francisco. They then traveled by boat from San Francisco to Portland, Oregon. The interview indicates that there were such severe storms during the boat ride that they feared they would sink. They then found their way from Portland to southern Oregon. The interview also indicated that part of their journey was by train and part by "team and wagon." They purchased a farm along Bear Creek in Manzanita Precinct, several miles northeast of Jacksonville, Oregon. It appears that they homesteaded a farm of 160 acres and were issued the land patent in 1878. They also apparently purchased some land from Jacob Ish, who lived nearby. Eventually, in the mid-1880s, the city of Medford sprang up south of their farm. For many years the farm was about three miles north of Medford, but it is now within Medford's city limits. Eventually, the Murray farmhouse burned down. Today, the site is along Crater Lake Highway and is covered by a Walmart. James Murray farmed until his death in 1885. Afterwards, Flora was apparently sickly and unable to care for herself. Her daughter Sarah Murray Gorden and family came to live with her and were her caretakers until her own death in 1896. Flora married James Murray on November 3, 1850 in Loran Twp., Stephenson Co., Illinois 4. 5. Bartlow, David E. James Barkelow (1753-1834) of the Revolutionary Flying Camp. Printed in the USA, 5th Edition, 2000. Bartlow, David E.,James Barkelow (1753-1834) of the Revolutionary Flying Camp, Privately Printed, 2000.